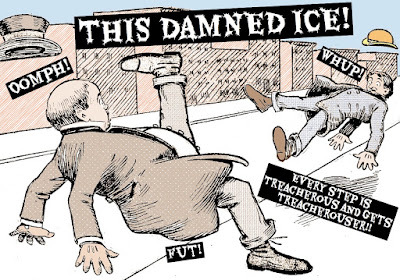 I swear, I'm starting to think that ice can be downright dangerous! You try to walk on it and if you happen to make a mistake -- in an unguarded moment of carelessness -- you can go right down! 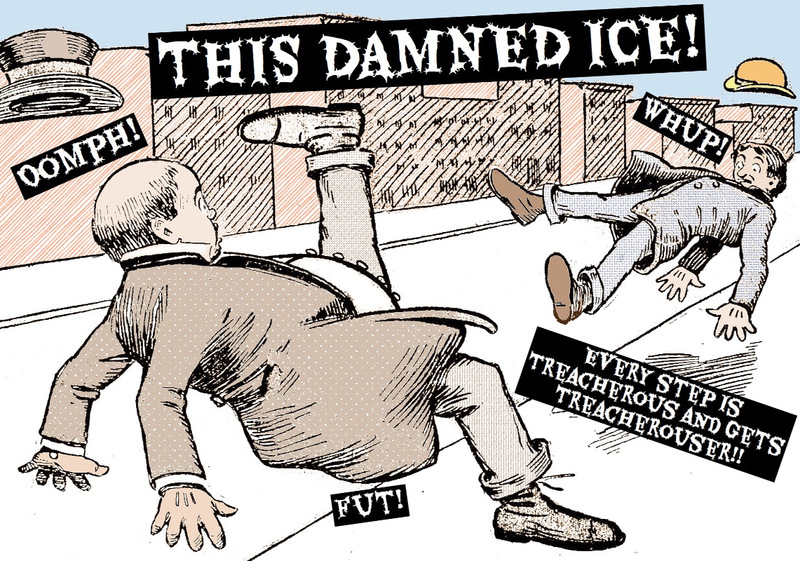 Very slick stuff, ice is, a hazard, a public menace. But what can you say? Sure you hate it, but it's as natural as anything else. You get the right combination of moisture and temperature, and similar to those little trays in the freezer, you've got ice! They don't call it "the icebox" for nothing! And wouldn't you know it, it's winter, and we're prone to experiencing it firsthand, nature at its worst, which has lulled us into a continual confidence vis-à-vis our legs by uprightness from warmer times being the norm, only to upend us when the cold comes to bear. Slip! You're down, with no undo button, and left to survey the possible damage: "Are my legs injured, did my hands get hurt, how's my all-important spine?" I've known people who've been terribly injured on the ice, then others (like myself) who've come through falls with almost miraculous deliverance. One time I remember clearly was probably 35 years ago, when my feet went out from under me slick as snot, as we used to say. This was split-second stuff, whoosh! And I hit my head with some violence where I stood. It hurt like hell but shocked me worse, shaking me not just by the physical pain but with what it did to my normal breezy confidence. 'If that could happen as fast as that,' I must have thought, 'then, really, what confidence can I have?' The lesson stayed with me and I've been more careful since. The greatest part of it was I wasn't injured beyond the immediate pain. I shake my head and it's the normal rattle. Today was the day we were dreading, an ice storm for the ages coming in. When I heard there would be ice build-up of a half inch, in my imagination that's the biggest half inch ever; I pictured it as something closer to three times that. Do I have a faulty imagination? I was never great with math. Or is it that I fear the possibilities of enormous ice so much that to be extra safe is to be extra careful, and as a reminder to magnify the predicament? Could be. I do lots of extraneous stuff, and careful redundancy is my middle name. I make backup copies of grocery lists in case the original is lost. Good thing I don't knit sweaters; they'd be so thick they'd last forever and suffocate you. As it turned out, at least during the day and in town -- and it may have been worse in other places -- the ice storm was nothing much. Once I got out, inching my way to the car, and casting my ice melt upon the frozen waters, I realized it was nothing. I didn't have a problem in the world! The roads were great. I didn't see a single car in the ditch, whereas during a less-dreaded storm a couple weeks ago I saw two cars spin out in three seconds and wisely turned the other way. What it was like on the interstate, though, I can only imagine. Ice is always so much worse there, with maniac truckers flying by at 80 mph and throwing it on your windshield a foot thick if it's an inch! I also didn't see anyone fall on the ice. Good for them, but bad for me. Couldn't rush over and do my good deed for the day, helping them up and issuing a heartfelt warning, "Be careful next time, stupid. Let me tell you what happened to me 35 years ago, and everything I learned from it..."